Make Up For Dolls: YSL Beauty, Google Glasses & Brown Thomas Dublin - weird but interesting collaboration! YSL Beauty, Google Glasses & Brown Thomas Dublin - weird but interesting collaboration! Now here's something verrrrrry cool which appeals to both the Makeup Nut and the Geek in me. Although the Google Glass project has, as far as I'm aware, been cancelled, there are still prototypes lying around and this is a particularly clever collaboration between Yves Saint Laurent Beauté and Google Glass - a "bespoke makeup tutorial experience", available exclusively at Brown Thomas Dublin as part of their Spring Beauty Event this year. This "complete retail experience" aims to capture makeup application through the eyes of the professional (so presumably the MUA wears the Google Glasses), allowing the person having their makeup done to benefit from the perspective of the makeup artist later on - footage of the makeover is recorded, along with a before-and-after shot, advice and the step-by-step tutorial of the personalised makeup experience. This highly customised video footage is later emailed to the customer, along with their tutorial footage, and (even more clever) the list of suggested (YSL Beauté, natch!) 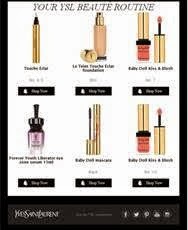 products used with direct links to buy (presumably from the Brown Thomas website). This is a genuinely clever example of a clever use of a technology for which there really weren't any hard requirements, it really was a "solution without a problem" to-date, technology for its own sake really. I'm liking this. I am going to book in. It's from 11th March I believe and in BT Dublin only to my knowledge. Fred Letailleur (YSL's North European makeup brand ambassador is on-counter on 10th March for a series of masterclasses and 11th March for the Irish unveiling of Google Glasses for Yves Saint Laurent Beauté. Appointments will cost €35, but they're redeemable against purchase on the day.